Last Friday, Whole Foods opened its biggest store in the southeast on the corner of Spring and 14th Street. Although this is not the first Whole Foods in Midtown, it is centrally located in the Midtown business district and right next to Tech’s campus. This prime location caused loads of Tech students to flood in for opening weekend and will surely allow many students to take advantage of the Amazon Prime discounts to get healthy groceries at a reasonable price. The long-delayed opening has been highly anticipated by Tech students since it was announced that the location had been selected for the new store. But the frustration that Tech and Midtown residents felt while waiting for the store to open is overshadowed by the impressive amenities and restaurants the store has to offer. 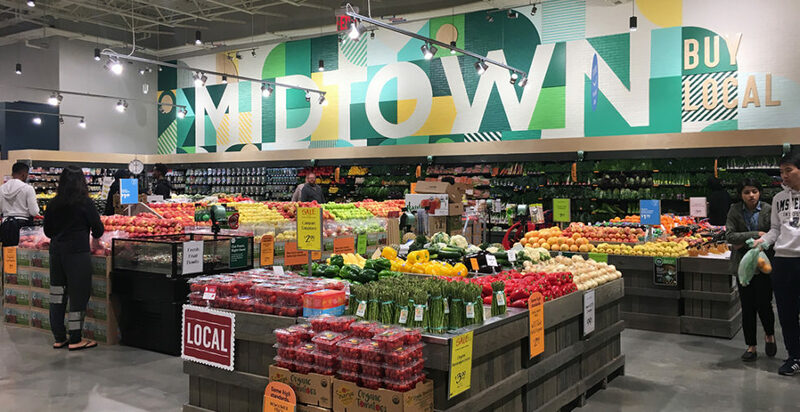 Fully equipped with a coffee shop, juice bar, rooftop patio and several restaurants opening later this year, the mega-grocery store has surely surpassed expectations. The excitement of the opening led to early morning lines awaiting the grand opening and the store being packed from open until close last Friday. Many Tech students flocked to the store to the store to get a peek inside. Many other students feel the same way. Offering everything from live music to fitness classes, the store brings more than just shopping to the Midtown community. Inside the store, Whole Foods offers a large variety of fresh produce and organic products. “I was shocked by the creative ways that they presented their fruits and vegetables,” said fifth-year CE Nack Kyoo Jung. The produce section has seemingly everything under the sun, including a “Produce Butcher” that takes a spin on typical butchers by providing the service to get your fruits and vegetables sliced freshly for you in store. Many also believe the store provides all the groceries needed at considerably lower prices. “Being a Prime member really made Whole Foods comparable to typical grocery stores,” said Kyoo Jung. “I’m able to get cleaner food without having to pay luxury prices for it.” With the changes that Amazon has made since purchasing the store, the decrease in prices has helped expand the reach of Whole Foods to markets like the college aged one, who tend to be more health conscious than ever. The location is optimal for many college students, who often prefer to walk to get their groceries. Whole Foods is a one-stop-shop where people can purchase food and toiletries that they may need around the house, as well as pick up a fresh meal from the many options the food court has to offer. The store offers a beauty section where they have people on staff to consult on makeup, bath products and even a wide range of essential oils and natural supplements. Since its opening, the popularity the store does not seem to be dying down.